There are 3 different outlooks of the inventory stock count which aids you to make various decisions such as sales forecast; if there will be sufficient stocks to fulfill your upcoming sales and appropriate timings for stock re-order. It is also imperative to grasp how the 3 different types of quantity are derived in order to understand the changes in your stock figure caused by the various stock movements. In stock – This is the quantity you have in your stock location, in which a portion of it may have been committed for your sales order hence the In Stock is usually not a definite indication of how many upcoming sales you can fulfill. Available Qty(Exc PO) – The available quantity(Exc PO) excludes the existing sales order(s) that have not been delivered, allowing you to know the leftover figure available for your upcoming sales. 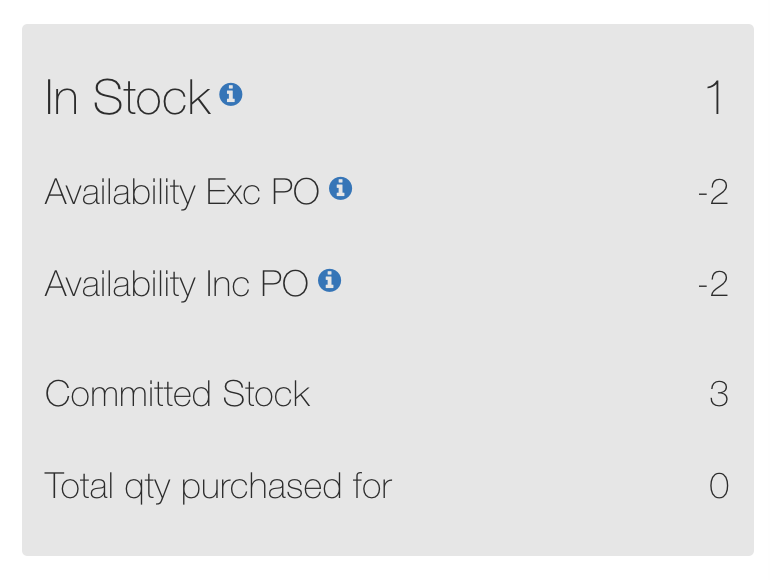 Available Qty(Inc PO) – The available quantity(Inc PO) excludes the existing sales order(s) that have not been delivered and includes the purchase order(s) that have not been received, providing you with another level of projection on how many incoming stocks are expected from your purchase order(s). This quantity comes in handy for situations where you have upcoming sales to fulfill but do not have a definite date for delivery; allowing you to decide if new orders can be committed by determining if there will be sufficient stocks eventually to fulfill these orders when the purchased stocks arrive. When a new purchase order is being created, only the Available Qty (Inc PO) will be increased. All 3 quantity types will be updated after the stocks have been received from your Purchase Order. When a new sales order is being created, the Available Qty (Inc PO) and the Available Qty(Exc PO) will be decreased. All 3 quantity types will be updated after the stocks have been delivered. In Stock: remains at 100 since stocks are not delivered yet. In Stock: 100 (In Stock) – 20 (Delivered) = 80 since stocks have departed from your stock location. 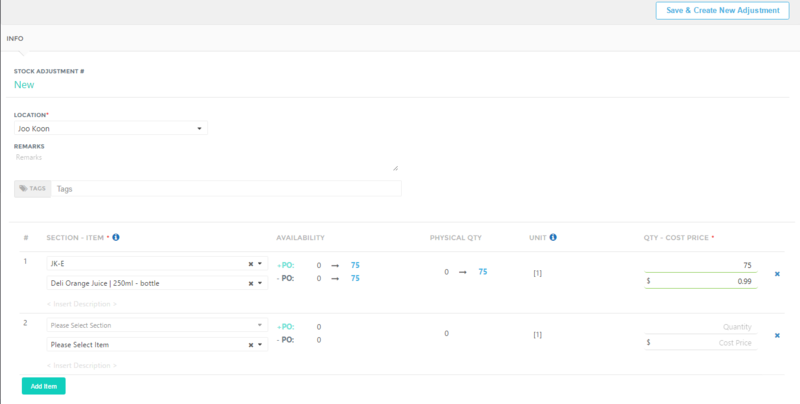 You can manually adjust your stock quantity in situations when there an increase or decrease of stocks due to various reasons such as new stocks from production or damaged goods. A stock adjustment will affect both physical and available quantity. If you manage and distribute your stocks from multiple stock location, you can do a stock transfer from one location to another. A stock transfer will affect both physical and available quantity on both source and destination stock location. Stock take to Stock-taking or "inventory checking" is the physical verification of the quantities and condition of items held in an inventory or warehouse. This may be done to provide an audit of existing stock. It is also the source of stock discrepancy information and change your instock number. Enter counted quantity > Save. The app will show you the discrepancy between counted quantity and existing stock, the number you entered will be the instock quantity once saved.